Linda is a customer who contacted us from Severn MD. She needed emergency garage door service. It just so happened that we had an available technician to send to her rescue. We dispatch our technician using our mobile dispatching app and Linda got prompt service to resolve her garage door emergency. A Customer in Herndon, VA – Igor. Called to schedule an appointment for an overhead garage door repair service visit. He got the standard service that customers receive when they call 495 Garage Door. What is that standard service – you might ask? Igor received professional, punctual, and courteous service. That is the standard service we offer at 495 Garage Door. Margie from Suitland, MD contacted us because she had a broken overhead garage door. Fortunately for Margie, she contacted a company that prides itself in having expert technicians who provide professional service. Margie received an affordable garage door quote and decided to replace her inoperable overhead garage. Our friendly garage door technician helped pick her new overhead garage door from her home. Here’s one story we don’t hear often about other garage door servicing companies. Donna from Highland, MD shared that the technician from 495 Garage Door was “a good listener.” It doesn’t surprise us - we have technicians who offer personable, reliable, and patient service. Donna received above average garage door service and that’s the expectation we want our customers to have about us. This story reminds us that winter is around the corner. Kari in Silver Spring, MD needed garage service. The technician encountered an issue when he arrived at Kari’s home. There was ice on the driveway that needed to be removed. He helped remove the ice because our customers matter to us. Providing service that goes above and beyond the norm is natural at 495 Garage Door - it's our norm. 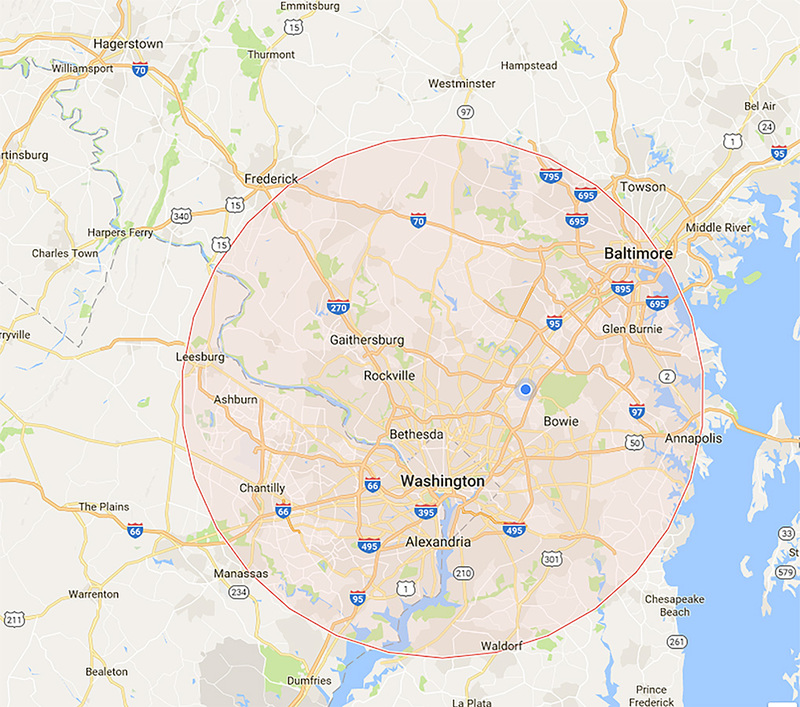 The customers we service live across our service areas is Maryland, District of Columbia, and Virginia. We service customers within a 30 miles radius of Silver Spring, MD – our company location. Customers in Tysons VA, Bethesda MD, Alexandria VA, Rockville MD, Bowie MD, Gaithersburg MD, Herndon VA, Waldorf MD, Annapolis MD, and Ashburn VA are within our service area. Our customers can expect prompt, reliable, affordable garage door services from 495 Garage Door. We are committed to providing excellent and affordable garage door services to customers. In our effort to maintain and improve our level of service we have employed multiple web platforms to gather feedback from our customers. Read more about it in this blog post - Excellent Garage Door Service is Our Mission. We service all the best overhead garage door brands, liftmaster garage door opener, clopay garage doors, chamberlain liftmaster, genie garage door opener, craftsman garage door opener, and wayne dalton garage doors. The major overhead garage door parts we service are, torsion springs, garage door sensors, garage door seals, overhead garage door panels, garage door locks, and automatic door openers. Our main office is located in Silver Spring MD, our teams of garage door specialists and technicians are serving all towns and cities of Montgomery County MD including Gaithersburg, Olney, Rockville, Takoma, ParkAshton-Sandy Spring, Barnesville, Brookeville, Garrett Park, Glen Echo, Kensington, Laytonsville, Poolesville, Somerset, Washington GroveAspen Hill, Bethesda, Brookmont, Burtonsville, Cabin John, Calverton, Chevy Chase, Clarksburg, Cloverly, Colesville, Damascus, Darnestown, Fairland, Forest Glen, Four Corners, Friendship Heights Village, Germantown, Glenmont, Hillandale, Kemp Mill, Layhill, Leisure World, Montgomery Village, North Bethesda, North Kensington, North Potomac, Olney, Potomac, Redland, Silver Spring, South Kensington, Travilah, Wheaton, White Oak. We also have teams of garage door experts in other regions of Maryland, Virginia and Washington DC. We provide garage door installations and repairs to cities and towns of VA including Annandale, Tysons, Springfield, Fairfax, Ashburn, Herndon, McLean, and Alexandria. We offer expert garage door services to residents of the Potomac region as well as Washington DC.